The Human Rights Centre of the University of California at Berkeley recently reported that Israel’s security forces have carried out a “widespread”, “frequent” and “indiscriminate” use of tear gas against Palestinian refugees in Aida refugee camp near Bethlehem. 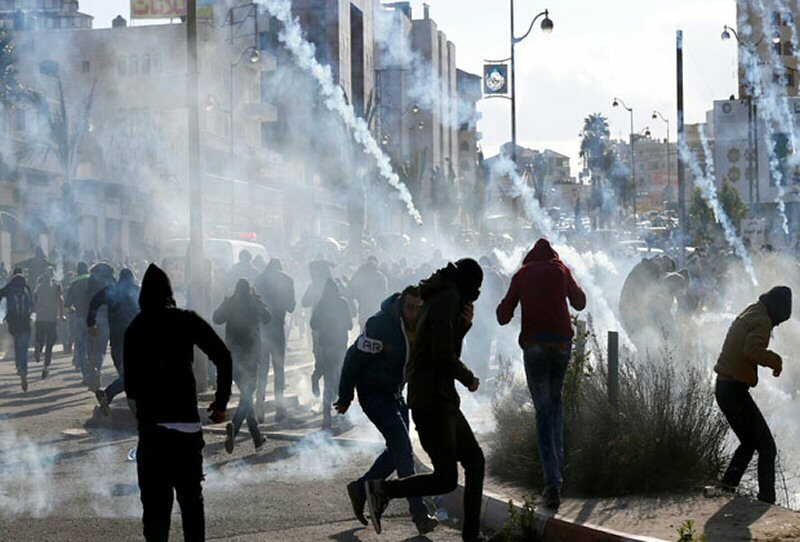 The report – said to be the first to analyse the effects of tear gas in the West Bank – found that 100 percent of the more than 200 Palestinian residents surveyed in Aida camp were exposed to tear gas over the past year. The report, No Safe Space: Health Consequences of Tear Gas Exposure Among Palestine Refugees, collected testimonies last summer in Aida and the nearby Dheisheh refugee camp. “We found that the constant and unpredictable use of tear gas in Palestine refugee camps has a devastating effect on the mental and physical health of residents,” said the report’s co-author, Dr Rohini Haar, a researcher at the UC Berkeley centre and a doctor with Physicians for Human Rights. The effects, Haar told Al Jazeera, are especially harmful on “the most vulnerable, including pregnant women, children, the elderly, and people already in ill health”. The report surveyed 236 residents of Aida, all of whom said they were exposed to tear gas in the last year. Of that, 84 percent of people said they were exposed while in their homes. As its name implies, tear gas is intended to cause a person’s eyes to water and skin to burn. Residents also told the report’s authors that the Israeli army’s use of tear gas was “primarily unprovoked”. The Israeli army did not respond to Al Jazeera’s request for comment on the study’s findings. Refugee camps are among the most vulnerable to tear-gas exposure in the occupied Palestinian territories, the report states. Home to about 6,400 Palestinian refugees, Aida covers just 0.017 square kilometres, making it one of the most densely populated places in the world. Clashes between Israeli security forces and Aida camp residents are frequent, with the UN agency for Palestinian refugees (UNRWA) estimating that at least 376 confrontations took place between January 2014 and December 15 of this year, the report stated. “Our life here in the camp is filled with tear gas, filled with stun grenades, filled with skunk water,” said 30-year-old resident Sabreen, the mother of a Palestinian prisoner, referring to a foul-smelling liquid frequently sprayed by the Israeli army on Palestinian protesters and homes across the West Bank. “It is the life of a refugee. What can we do?” added Sabreen, who did not give Al Jazeera her last name. Firing tear gas near homes violates the UN Code of Conduct and the UN Basic Principles on the Use of Force and Firearms by Law Enforcement Officials, the report stated. It also explained that homes and schools are not designed to shield against tear gas, leaving residents with few options to avoid it or reduce its effects. Last Friday, Al Jazeera saw the Israeli army fired hundreds of tear-gas canisters into a small crowd of protesters in an area bordering Aida camp. Limited clashes also spread into the camp, where Israeli soldiers responded with more tear gas. “I came back home from a wedding, and I found 25 gas canisters near my home,” said Sana, a resident of the camp, who also did not give Al Jazeera her last name. Many residents of the camp have taken to wearing gas masks to protect themselves, though they are difficult to obtain and costly. According to Dr Haar, regular exposure to tear gas can affect “all [the] body[‘s] systems”. In the report, residents described various physical effects from such frequent exposure to tear gas, including losses of consciousness, miscarriages, trouble breathing, asthma, coughing, dizziness, rashes, severe pain, allergic dermatitis, headaches, neurological irritability and even blunt trauma from being hit by tear gas canisters. “Everybody’s system is affected by this,” Dr Haar said. The Israeli army’s frequent use of tear gas has also had left residents with psychological scars. Because of the random nature of the Israeli raids, Aida camp residents find them themselves “perpetually on edge, fearing the next attack”, according to the report. Amal Manasra, 27, a resident of Aida, told Al Jazeera her infant daughter was recently exposed to tear gas after a canister fired by the Israeli army landed near a door to her home. “The oxygen level was zero … She was suffocating … We carried her to the hospital … She spent seven days there,” Amal said. “We are in an area we are exposed to shootings daily, to smelling tear gas. I have kids. The gas leaks into the house through windows and from under the door,” she said. Dr Haar told Al Jazeera that “no one else experiences this level of tear gas”. The protests against US President Donald Trump’s recent recognition of Jerusalem as Israel’s capital have increased Palestinians’ exposure to tear gas, the study found. Meanwhile, Palestinians have also alleged that the gas has become more potent. “This is not tear gas; it is poison,” Thaer, another Aida camp resident, told Al Jazeera. While tear gas is usually composed of a mixture of synthetic or naturally occurring gases, including pepper spray, “the specific chemical utilised by the [Israeli security forces] in recent years is unknown”, the report stated. According to Dr Haar, “the Israeli government is obligated to disclose the composition of the tear gas” it uses so medical professionals can treat the symptoms the chemicals cause. Meanwhile, Chris Gunness, UNRWA spokesperson, said the “report raises serious concerns about the use of tear gas in heavily built-up areas such as the refugee camps in Bethlehem”. “The widespread, indiscriminate and frequent use of tear gas exposes refugees including our own staff to health risks, but at this stage, it is impossible for health professionals to fully assess these risks and the long-term impact of prolonged and regular exposure,” Gunness told Al Jazeera. 12/31/17 Why is Egypt Counting on US Aid to Israel?